Sock'n Boots: Adventures is a Children's Picture Book. Sock'n Boots wish to teach children different life lessons through their own experiences. Each of their stories begins with a question, the story will present itself, then the question is repeated again. This is designed to help stimulate positive thinking and expression of thoughts. 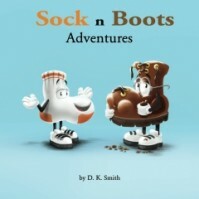 The Adventure's book combines all three of the Sock'n Boots series into one book. Share, Afraid of the Dark and Play It Safe have been compiled together to help bring these important lessons to your child. Sock'n Boots: Share - the reader is asked if they know how to share and then Sock and Boots will show you through the outcome of their actions. When the two head to the park for a picnic, the birds have eaten Socks lunch. Not to worry though, Boots comes through and shares his lunch with Socks. Sock'n Boots: Afraid of the Dark - After Socks goes to bed he hears bumps in the night and this frightens him. After he checks over his room, he feels safe and shares his message with the reader. Sock'n Boots: Play It Safe - Socks is looking for a new place to play and after he finds one, he tries to convince Boots to play there too. However, Boots doesn't think its safe and after mishap happens to Socks, Boots is there to save the day. Each of these stories are shared in a rhyming prose that children will find easy to follow and understand. The illustrations depicted by Lorena Isabel are highly detailed, wonderfully coloured and provide children with thought-provoking questions to the depictions shared. I would give Sock'n Boots: Adventures a five out of five stars. I found the stories to have a message that all children should have knowledge of and the lessons were told in an entertaining manner. The prose is easy to read and those who are just beginning to read will find great pleasure in sharing these stories. Also found at the back of the book are several colouring pages for children to further enhance their creativity, so it provides hours of amusement. I think this would make an excellent addition to your home library and I am sure it will become a favourite your wee ones will love. The first three adventures of Sock and his pal Boots have been rolled into one exciting children's compilation. Nice Blog The post seems to be really interesting thanks for sharing it :)!